It's been a long time since I wrote something but I have been involved in many things that kept me super busy. Anyway, I just want to let you know that a website called Yemjob has been recently launched. If you are from Yemen or you are seeking employment in Yemen then you will find Yemjob useful. If you have been watching the news recently, you might have heard about the "Aurora" exploit. The exploit was used to compromise systems at Google, Adobe, and other high-profile companies. It targets an unpatched vulnerability in Internet Explorer that allows an attacker to execute arbitrary code on the victim's computer. As ususal, I wrote my version of the exploit and posted the code in the software section. The exploit is based on code I found in the wild but has been improved to enhance the exploit's reliability. There is an unpatched vulnerability in the latest and earlier versions of Adobe Reader and Acrobat. I've added to the software section a program that generates a PDF file to exploit the vulnerability. I've added some of the exploits I wrote in the past to the software section on my site to make them easily accessible to anyone who is interested in them. I've also added new tools, which you might find useful. An unpatched vulnerability in an ActiveX control (Microsoft Office Web Components) used by Internet Explorer is being actively exploited. My version of the exploit can be found here. The exploit's payload spawns the calculator. An unpatched vulnerability in an ActiveX control (Microsoft MPEG2TuneRequest) used by Internet Explorer is being actively exploited. I've written my version of the exploit in Python based on code I found in the wild. You can find the code here. The exploit's payload spawns the calculator. Finally, I got my own domain name and moved my website to a new host. I will be changing the content of the website and adding new stuff soon so stay tuned. 6a795bbd 8b08            mov     ecx,dword ptr [eax]  ds:0023:0c0c0c0c=???????? As you can see, the pointer copied to the ecx register should be pointing to a vtable (virtual method table). In the last line in the code above, you can see that control is transferred to one of the methods in the vtable whose address is stored at ecx + 0xc4. The vulnerability can be exploited by constructing a fake vtable at 0x0c0c0c0c (e.g., using heap spraying), where each method in the fake vtable points to 0x0c0c0c0c. The shellcode can be stored after the data that serves as the fake vtable. When control is transferred to the address stored at ecx + 0xc4 (0x0c0c0c0c), the bytes starting at that address will serve as a nop slide that leads to the shellcode. I posted a Python wrapper called vmpy that can be used to control a virtual machine directly from Python. The wrapper can be found here. I posted a tool called DLLInjector that can inject a DLL of your choosing into a running process. The tool can be found here. Finally, I uploaded my Master's thesis. You can find it here. A new variant of the Storm worm is using the following domain name: merrychristmasdude.com to infect unsuspecting users with malware. The link to the web page appears in spam messages sent out by the Storm gang using compromised machines. The message uses social engineering techniques to get you to click on the link. By simply clicking on the link and visiting the page, your system can get compromised as it will try to exploit vulnerabilities in the browser you are using or the installed browser plug-ins to download a malicious executable file to your machine and run it without your knowledge. If the exploitation fails then you might be tricked into manually downloading and running the malicious executable file from the page. As you can see below, a technique known as fast flux is used to hide the real web server serving the web page. Every time you try to resolve the domain name, it will point to a different IP address of a compromised machine that acts as a reverse proxy serving the web page. Check out this very cool paper. It's about context aware phishing attacks. 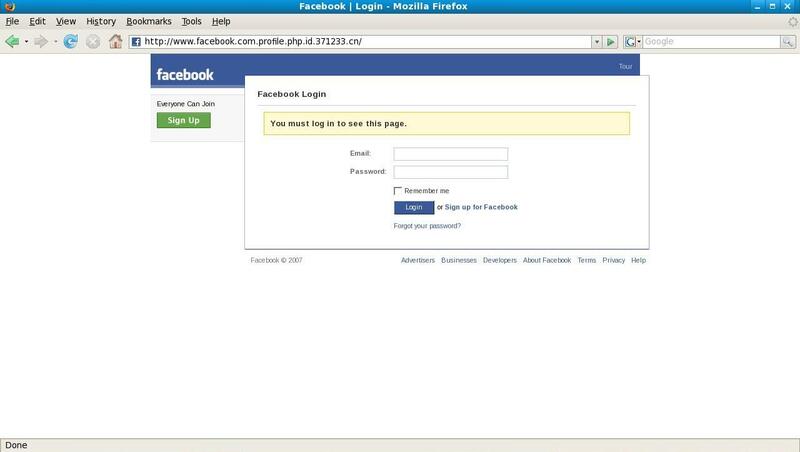 It shows how the information posted by people on social networking websites like MySpace, Facebook, etc. can be used to make phishing attacks far more effective.